Worming is not what it used to be and, nowadays, blanket treating is a thing of the past due the development of resistance. Worming equines is a subject that the equine community is rarely educated on, which is why the job of equine SQP’s is so important. Some organisations are trying to get the word out about this as the incorrect use of wormers is having a large impact on their efficacy. Resistance is a genetic mutation which allows the parasite to survive in spite of worming treatments. This parasite then passes the resistant genes to their offspring, thus resulting in more resistant parasites and a continuation of the cycle. Due to the fact there are currently no new wormer chemicals being developed, this is a major concern for horse owners as we could find ourselves in a situation with little or no treatments effective against worms. To protect the efficacy of the current treatments on the market, we need to all work together. What speeds up the rate at which resistance occurs? 1) Worming when there is no need to worm. 3) Worming with the same active ingredient repeatedly. 4) Under-dosing (wrong weight = wrong dose). With small redworm resistance already being wide spread with fenbendazole (Panacur) and reports already about the reduced effectiveness of other wormers, it is only a matter of time before all wormers are affected. What are the effects of worms on horses? 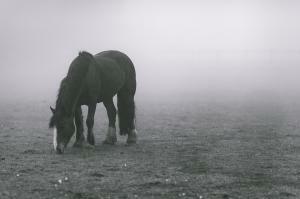 Worms can have a devastating effect on horses if left untreated. This includes colic, poor performance, diarrhoea, poor body condition, shock, damage to the gastrointestinal system, disease and even death. That said, small worm burdens are not dangerous and should be maintained at an acceptable, safe level. The aim of effective worm control is to prevent disease, not to achieve worm-free horses. Recent developments in technology mean we can now test for the presence of roundworm and redworm using faecal samples to detect eggs. We can also test for tapeworm using saliva to detect the level of tapeworm-specific antibodies. Worm counts should be used between March and October (every 6-8 weeks), with treatment only being necessary where results are 200epg (eggs per gram) or more. Elderly horses and foals should be worm counted more frequently (4-6 weeks) as they are more susceptible to worm burdens due to having lower immune systems (seek advice from your vet or SQP for a suitable programme). Roundworm usually only effects young and old horses, as adult horses develop their own immunity against this. Worm counts are, however, not reliable for tapeworm testing as their eggs are encased, but the Equisal saliva test works well for this and should be completed every 6 months in spring at autumn. Encysted small redworm cannot currently be tested for, which is frustrating as this is perhaps the most dangerous type of worm if left untreated. Encysted small redworm is the stage that goes into hibernation in the gut wall when it gets cold, only to emerge in spring and cause major internal problems. A burden must be assumed in the winter and treated with moxidectin (Equest) or, if you have completed a resistance test, a 5-day course of fenbendazole (Panacur). By following the guide below, you can reduce the risk of danger massively. Treat for encysted small redworm, using moxidectin (Equest) or a 5-day course of fenbendazole (Panacur). Carry out a tapeworm saliva test. Negative result = no treatment; positive result = treatment. Faecal worm egg count; under 200epg = no treatment; over 200epg = treatment required. Under 200epg = no treatment; over 200epg = treatment required. Negative result = no treatment; positive result = treatment. Carry out a faecal worm egg count. Under 200epg = no treatment; over 200epg = treatment required. Treatment will be based on your test results and also what wormer you used last time. If you need to treat, ensure that you use a different active ingredient to the one you used last time. Different chemicals are effective against different parasites, so if you are unsure, speak to your vet or SQP. People tend to avoid testing as they consider it inconvenient and time consuming, prefering to just give a wormer to be on the safe side. However, it is this mindset that is doing more harm than good. I use the testing method on my horse and it has proved to be very effective and stress-free! It also helps you to understand your horse more as an individual, and I love being at ease knowing my horse’s tummy is safe. Testing is not only healthier for your horse, but may save you the endless battles of trying to get your horse to take the wormer and then being at risk of giving the wrong dose. We have many SQP’s here at VioVet that are passionate about helping everyone get the best out of looking after their pets, so feel free to get in touch if you are at all unsure.